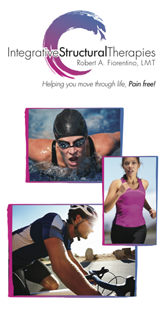 Intergrative Structural Therapies | Helping you move through life, Pain free! Is stress and tension affecting your quality of life? Are you an athlete or weekend warrior who would like to perform at a higher level or want to know how to prevent common sports injuries? At Integrative Structural Therapies, Robert Fiorentino, LMT, CPT, offers a variety of manual therapies and body work to help clients eliminate pain, as well as therapeutic massage for relaxation. Robert uses a whole body approach and non-invasive therapies to evaluate and treat clients. “My focus is on correcting the cause of your problem to eliminate the symptom of pain, restore normal range of motion and maximize your performance,” explains Robert.